Cherry kitchen cabinets – If you are looking for a warm and welcoming atmosphere in the kitchen, applying the design of cherry kitchen cabinets is the right thing to do. When you decide to upgrade your cabinet, you might wanna try to choose the suitable design of kitchen cabinet. In deciding the kitchen design, you have to consider your kitchen size, the style, and the shape. There are many colors that fit into a kitchen, but in this article, we are gonna focus on Cherry color on kitchen cabinets. 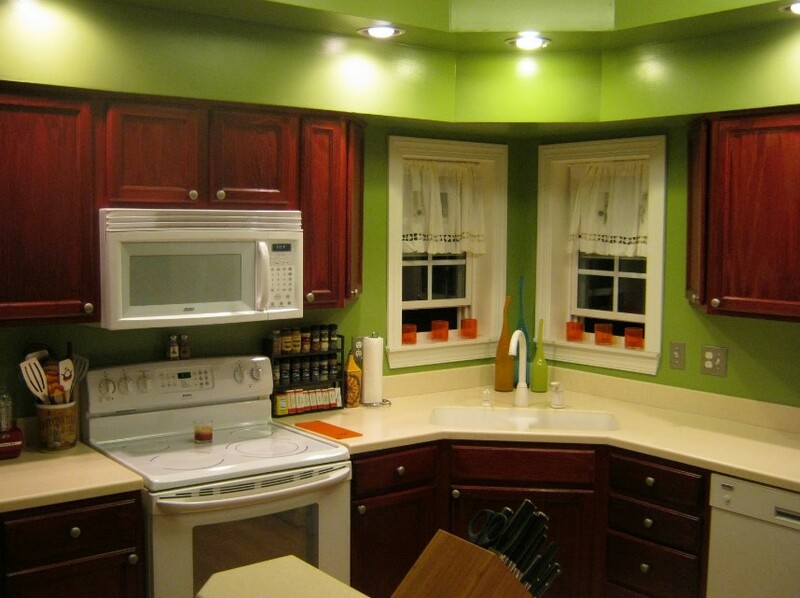 We know how much a color can make an impact on the room especially the most dominant furniture like a kitchen cabinet. The color of kitchen cabinet would decide the whole kitchen atmosphere. Take a look at this kitchen design by Briarcliff II, it offers a great experience for you who are serious about cooking, baking, and entertaining. 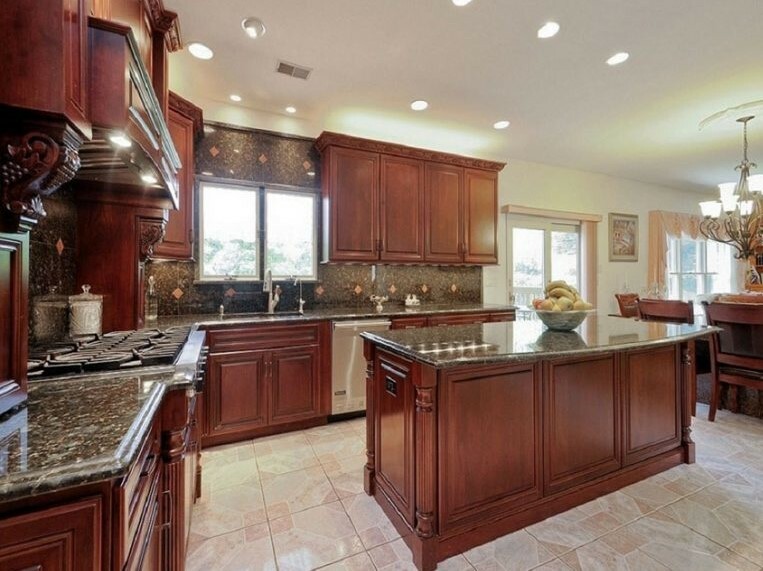 It has a double oven cabinet, completed with countertops in varied height. There’s an island cook top for you to prepare a meal. Those three features are just the beginning of the amazing cooking experience in this dream kitchen. 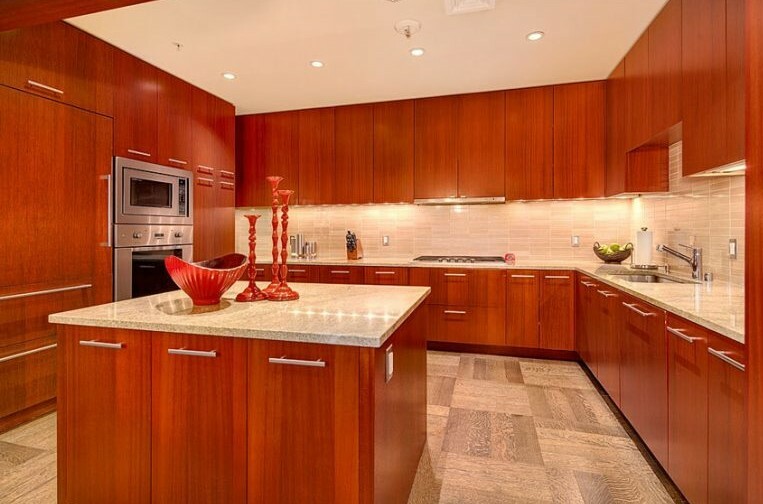 This kitchen is all dominated by the cherry color of the kitchen cabinet. All of the available space on the wall is occupied by the cabinet. You do not need to think about the wall color anymore, and you will have a lot of storage to put all your kitchen appliances. The cherry wood laminates all over the wall which maximize the warm impression from cherry. 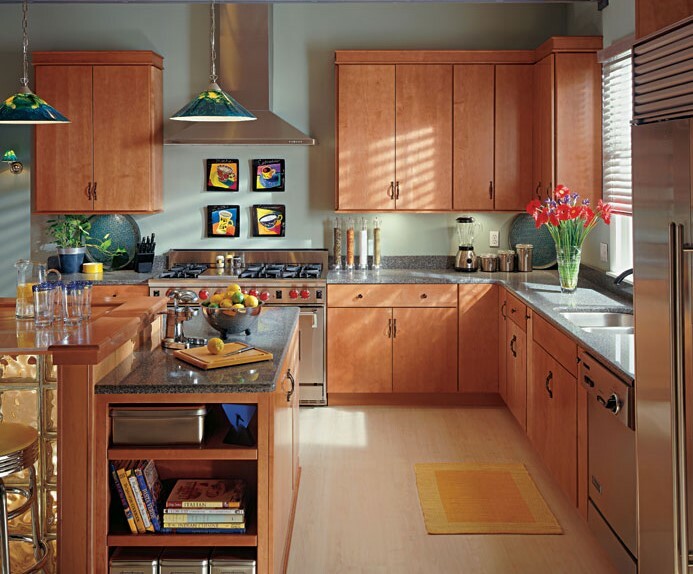 Hint: It’s recommended for your kitchen, to choose the cherry wood cabinets with the right color. Do not make it too dark or too light. When it’s too dark, it would look heavy. When it’s too light, the room can be too bright. 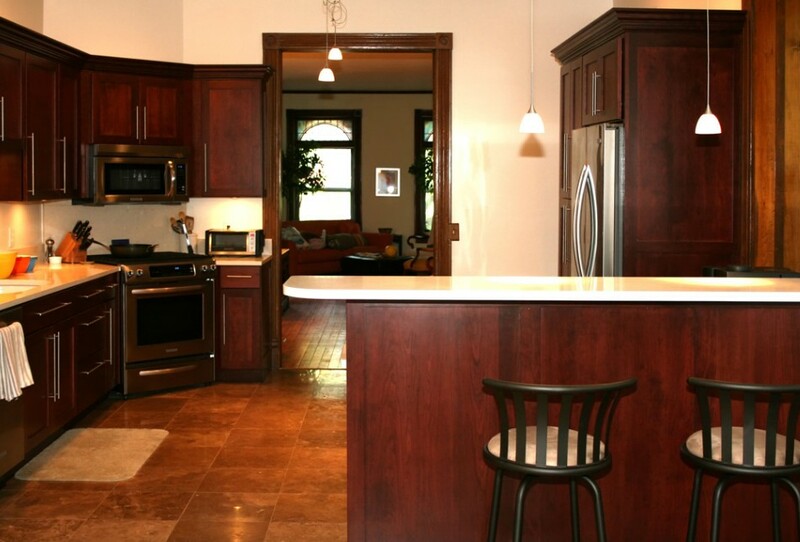 A dark cherry kitchen cabinet goes really well with that brick red wall. The neutral-colored surfaces are there to balance the dark shades in the kitchen. The countertops used cream-colored granite. The red undertone is there to accentuate. 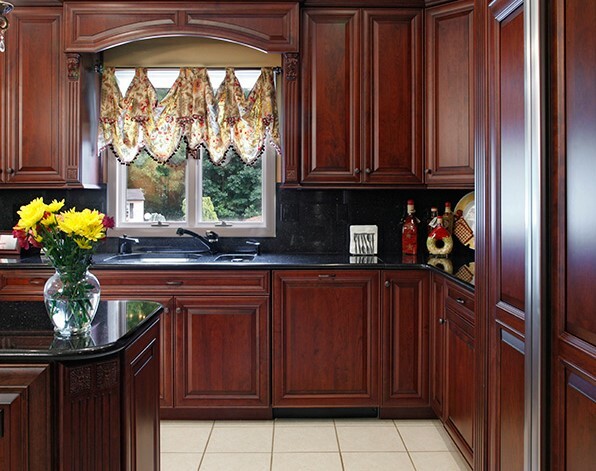 A dark cherry kitchen cabinet goes well with traditional looks too. 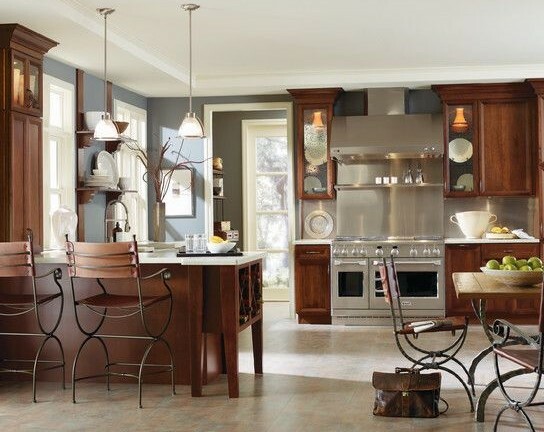 It adds elegance to your classic style kitchen. You can combine it with black granite countertops and backsplash. As you can see the enlightening floorings that are helpful to illuminate the space. This beautiful kitchen cabinet really stands out the attention. It really transforms the look of the whole kitchen. The windows become the center of attention when you are entering this kitchen. It gives all the lights that this kitchen needs. Hint: When you go with dark shades for our cherry kitchen cabinet, always remember to balance the darkness with the lighter shades of colors. The neutral family colors are the safest option you can have. If you only have limited spaces inside your kitchen, this kitchen cabinet design is created just for you. The paint colors are so contrast with the cabinet color, accentuate it with the green of nature such as plants or green flowers. The granite countertops are there to balance that contrast too. 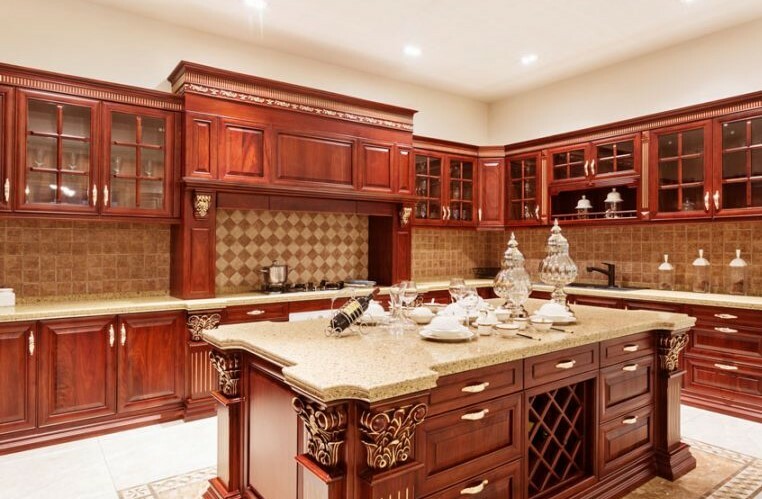 Looking so warm and elegant, this luxurious traditional kitchen blends really well with the cherry-colored cabinet. There’s a classical motif featured in these cabinets. That motif adds a touch of gold finish for a more luxurious and elegant appeal to the kitchen design. Hint: There are some other options of materials for the countertop but you have to consider about the quality and the budget you have when choosing it for your kitchen. Make sure, the material is easy to clean. Light shades of colors are well-known as the trick to make a small room to be more spacious. As you can see, this small kitchen looks more spacious with light cherry cabinet and light brown floorings. The gray countertops match the metal color which makes this room has a good color combination. With light cherry color, this small kitchen looks so spacious especially with the existence of small kitchen island which is also in light cherry color. There’s an extra space below the countertop of the small island which would be very useful to keep your kitchen utensil. The dark wood floorings make a perfect match with the kitchen cabinet. The light cherry kitchen cabinet is there as a lovely simple backdrop. It features glass block and some colorful accessories that offer a fun experience in preparing food and cleaning up more fun. Hint: Use a glass block and colorful accessories that match together. As you can see, it doesn’t have to be the large kitchen cabinets to be in every kitchen. You can have a small version when you think your kitchen has limited space. That cherry kitchen cabinet is not taking over all the walls. The dark-colored cabinet does need to be balanced with neutral color just like that white wall. This kitchen has a monochromatic style which is dominated by neutral color. 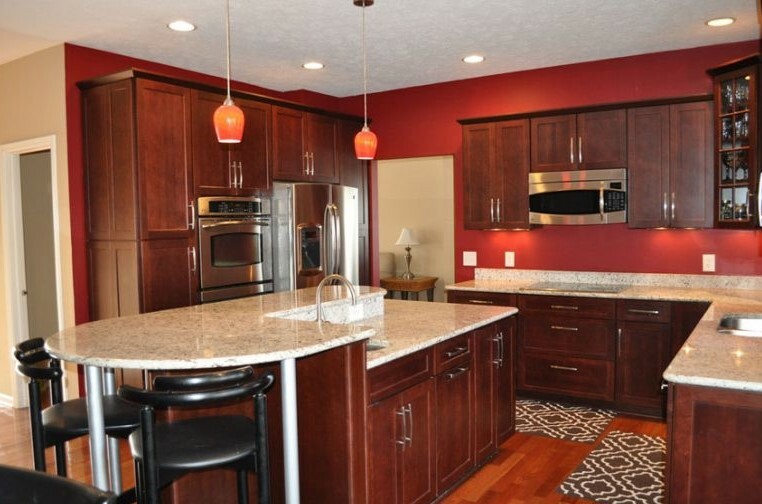 The white countertop looks so bright as the focal point, thanks to the island that has dark cherry color. Just like the dark gray frames on the background, it balances the brightness of the light neutral colors. Flat-paneled kitchen cabinet might be the most modern choice you need to apply in your modern kitchen. This modern kitchen design looks lovely. Besides the cherry kitchen cabinet, it has glass backsplash that would be very supportive of your kitchen activity. 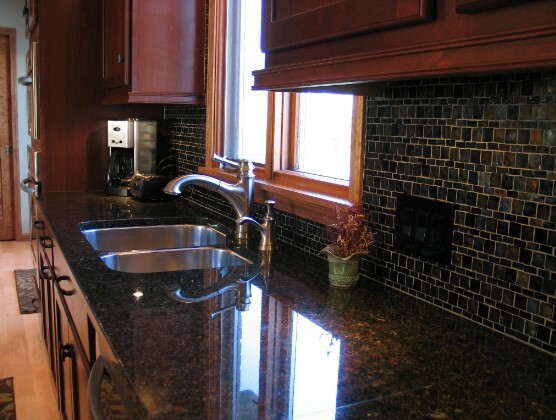 Hint: Using glass backsplash will give an advantage because it is easy to clean. 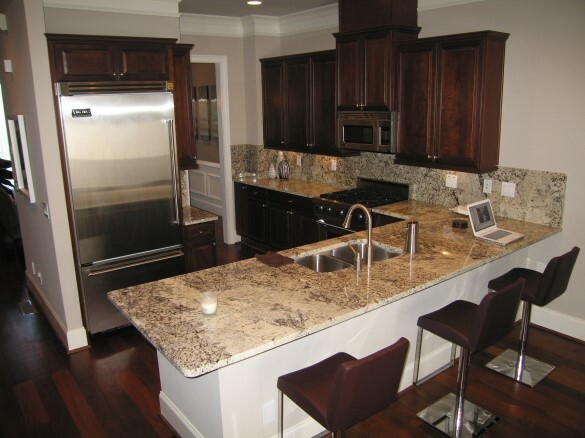 The granite countertops will make a good statement as a perfect accent to the kitchen. Choosing the wrong color shades would make the kitchen uncomfortable. There is some good option of backsplash you can choose for your kitchen with a cherry cabinet. Take a look at that glass tiles backsplash which makes a good addition to the cherry cabinet. The only thing you have to make sure is the color choice. When you go dark with the cabinet, you need to get a little bit lighter with the color choice of glass tile. 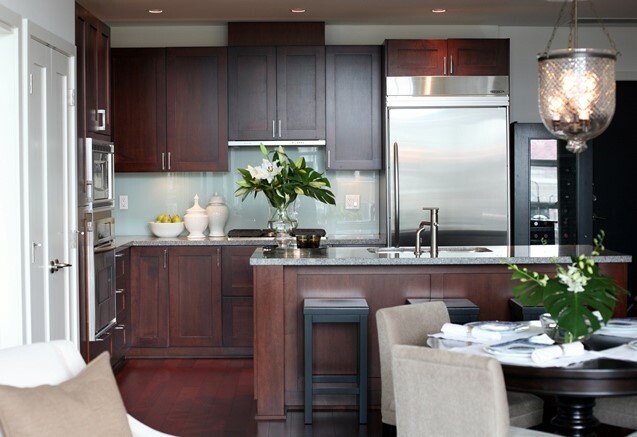 Hint: Similar to the previous kitchen design, this has darker shades of a kitchen cabinet. It needs to be balanced with the lighter shades like this gray glass tile. It’s even more impressive with under-cabinet light. It’s like emphasize the existence of that tile. There is some other backsplash ideas you can apply in your kitchen. 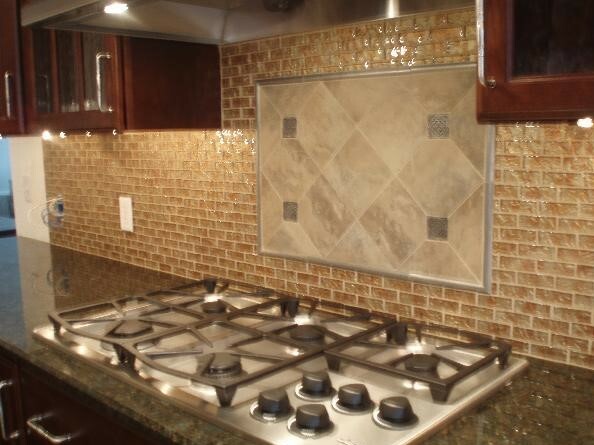 You can choose the metal backsplash which is friendly to heat. 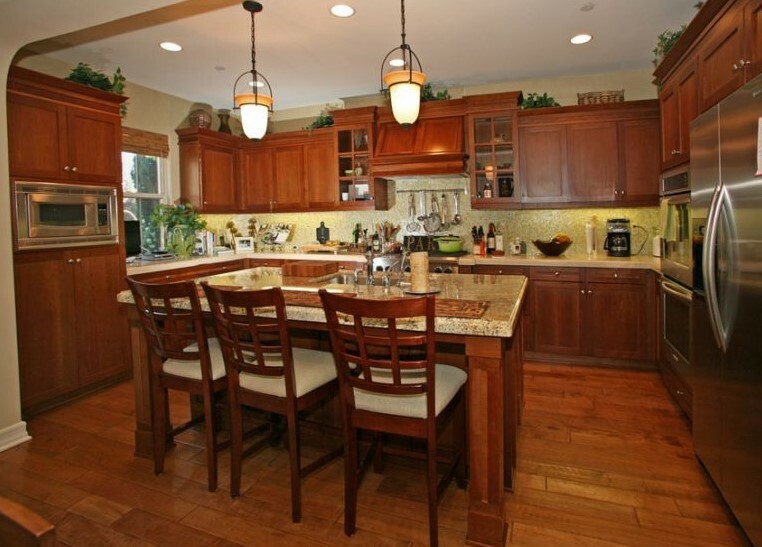 You can also go with traditional travertine backsplash which works well with your vintage kitchen. Ceramic tile can also be a good choice for your backsplash tile. It has various colors, forms, and patterns available. Choosing a neutral color as the wall color to be combined with cherry cabinets is the right thing to do. It is because most people already know that neutral colors family are the safest paint color for walls in almost every room. The neutral colors we are talking about includes black, white, shades of brown and gray. Cherry cabinets and white wall in the kitchen is a great choice. The neutral color would enhance the warm undertones which make the space to be more inviting. The neutral color wall won’t compete to the richness of cherry wood color. The wall’s role as the backdrop gives the cabinets a cleaner and brighter look. 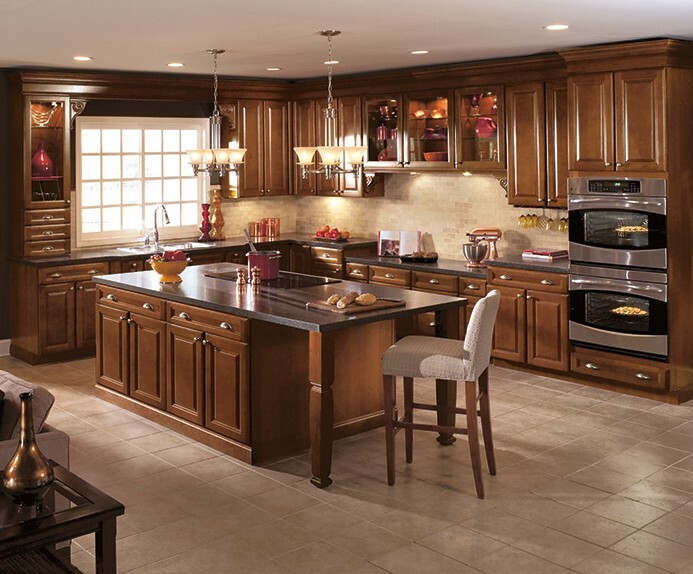 Lighter shades of color are a great choice for balancing the darker shades color from cherry kitchen cabinets. So, having a wall paint color in lighter shades such as pastel colors is the ideal option. Pastel colors would give cool and warm undertones to the kitchen. The cool undertones such as light green, light blue, and cool gray will uplift the grains in the cherry kitchen cabinets. Green might be the safest complementary colors you can paint on your kitchen wall. 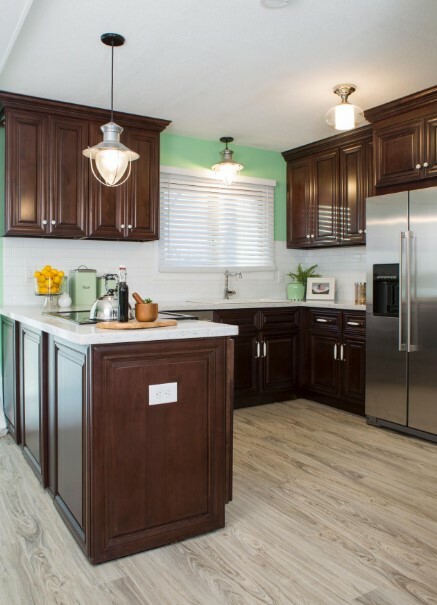 Along with the cherry kitchen cabinets and neutral accents, the green wall looks so balanced with all of them. It offers natural and warm atmosphere into the kitchen. You will enjoy your activity in this calm kitchen. In order to avoid monotonous color between green and dark cherry, neutral colors are there. If you want to add drama to your kitchen, green is the right color to work with. The green wall will make a cherry color pop. Hint: When you go with complementary wall colors for your kitchen, choose the cherry kitchen cabinet with lighter shades. Some people wouldn’t be comfortable with it. 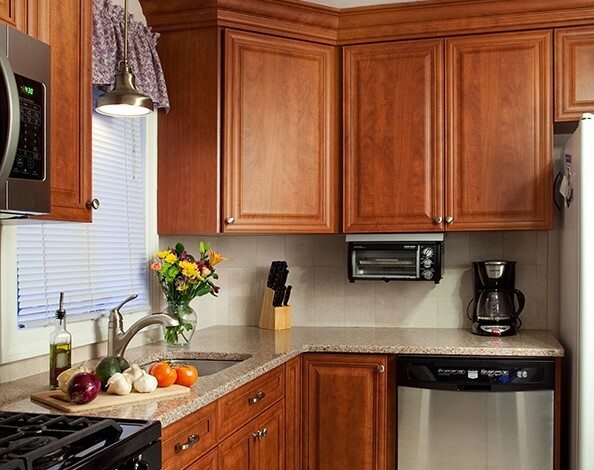 One of the most popular kitchen cabinets is the one with cherry wood. 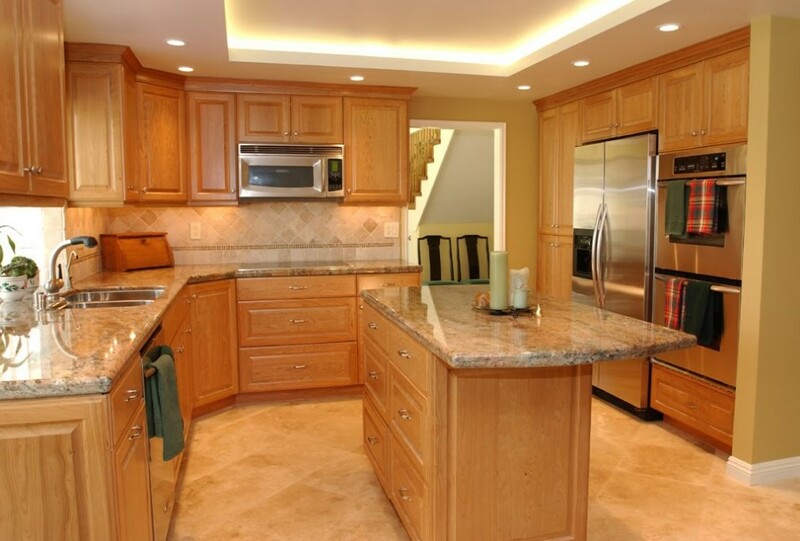 Cherry kitchen cabinets have a various option of designs you can choose to have in your kitchen. 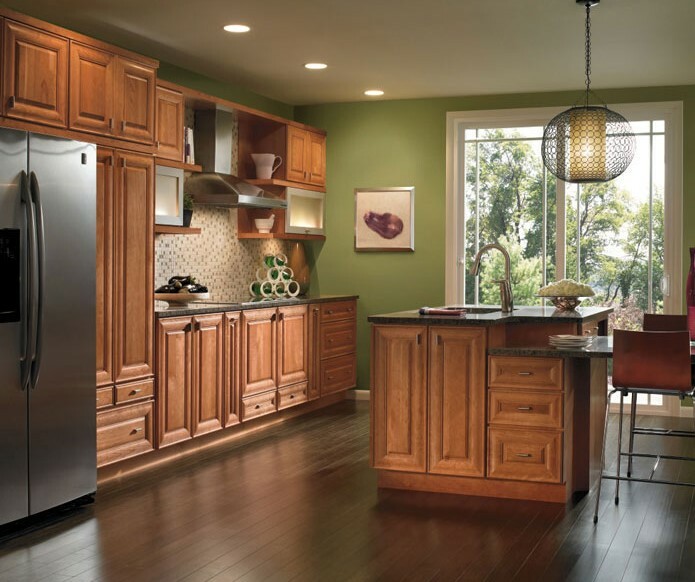 If you like the custom traditional style for your kitchen, a cherry wood furniture all over the spaces would be perfect. The cherry color goes well with the country style, modern style, and also luxurious vintage style. 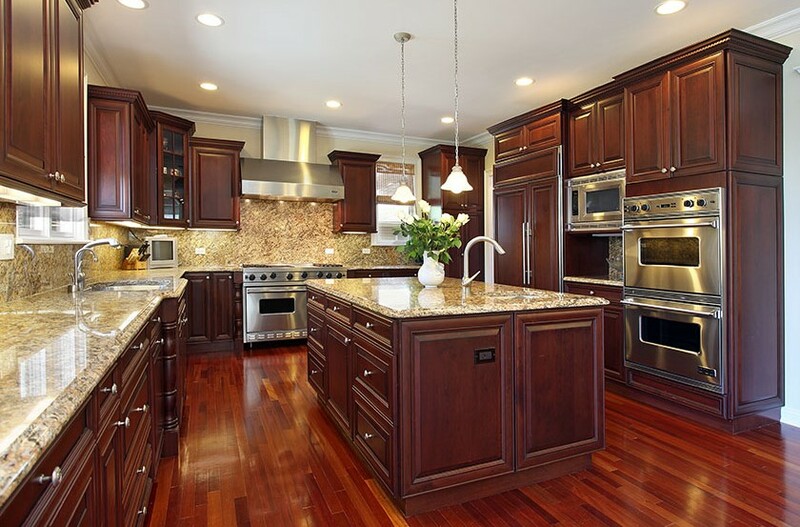 All of the above ideas would be very helpful for you in choosing the best combination for your cherry kitchen cabinets. All of them are things you need to consider in choosing the right partner for your cherry wood furniture. That would be very tricky and challenging.